Elite reception desks come with in a choice of 30 solid colour or wood effect laminates as well as a smaller selection of genuine wood veneers. This range of reception desks is distinguished by the cut back counter arrangement. There are three stunning and optional features for each desk type. Firstly a sand blasted glass shelf mounted on aluminium posts, the second alternative its for the same shelf to be mounted on stainless steel shelf supports with integral LED lighting. The third option is for these same claw supports with additional metal fluting containing and additional LED lighting feature mounted on the front of the desk. 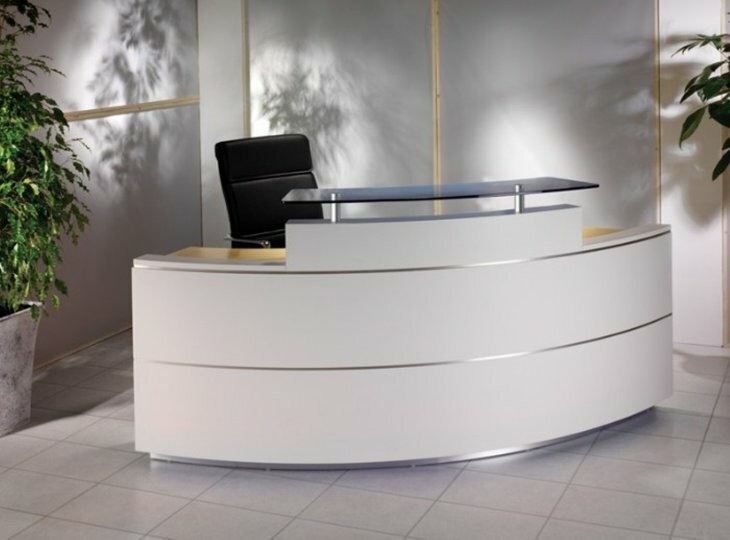 The reception desk forms one of the most important pieces of office furniture, not only in the reception area but through out the whole office. The reason for this is that potential customers, visitors and clients will be using this as their first point of call and first interaction with your company when they enter the building. 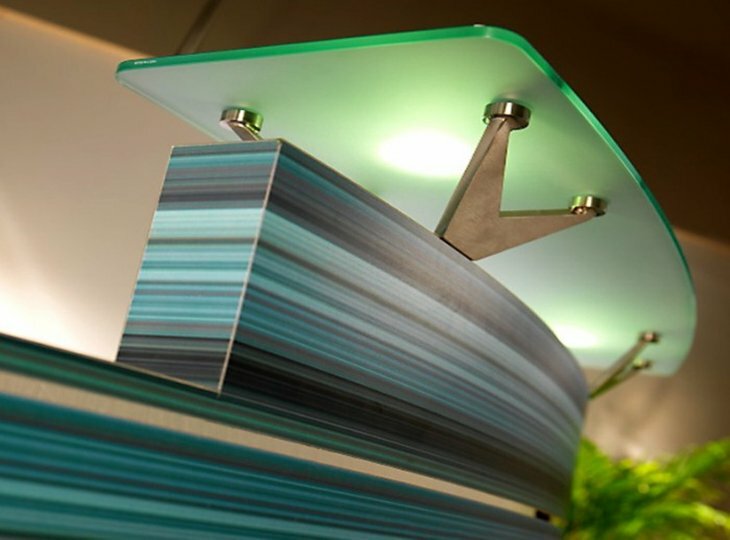 It is very important then that you choose the right reception desk that best reflects your company. 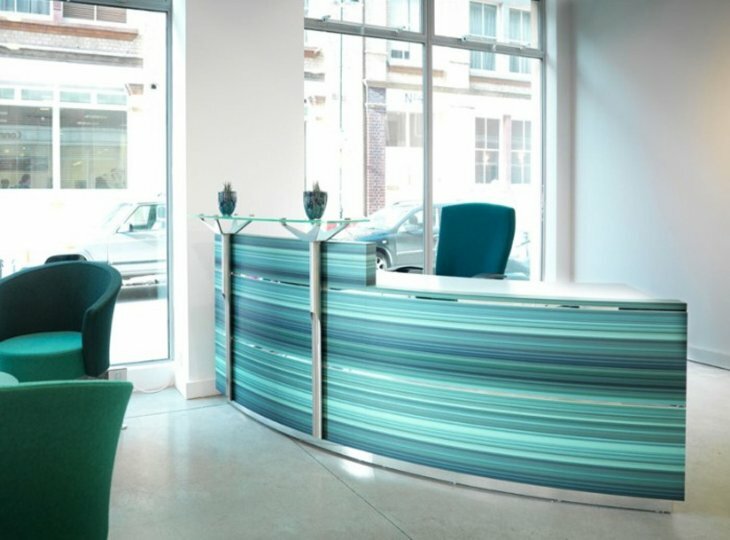 Whether you are going for the more modern or traditional look for the office, a good reception desk can help in making sure that your first impressions are positive. 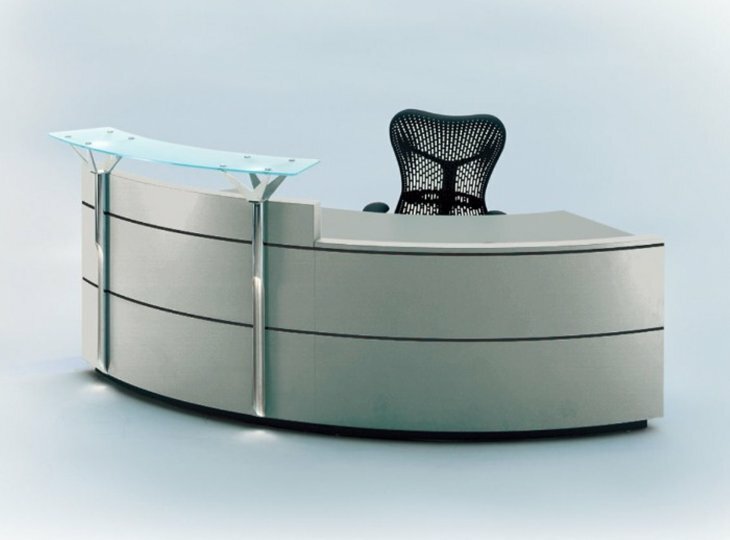 There are a large number of standard reception desk modules for one and two people depending on your personal preference. Some of these reception desks also feature a set back modesty panel for wheelchair access and are DDA compliant. The benefit of having stand alone reception desks is that you can achieve a designer looking reception desk at a fraction of the price of buying a modular designer reception desk. There are 48 different reception desks available in this section that include curved shaped desks for a single person or long straight desks with counter tops and low level sections. We are sure that you will find the right reception desk for you, if you like this particular style of desk. Manufactured in the UK many of these models are offered on a 10 day delivery service. As an additional bonus installation is included for all mainland UK orders. Buy with confidence by taking advantage of our free design and space planning service. Our friendly design team are happy to demonstrate in 3D format what your reception area will look like with its new desk.